Downtown Ice returns this weekend bigger and better than before. To celebrate 15 years, the rink is going to get a fresh look with new boards, rail caps, and mats. This season it will stay open all the way until January 27th for the NHL All-Star weekend, which is hosted at the SAP Center starting January 25th. Local Olympic gold medalist Kristi Yamaguchi is also hosting a grand opening celebration on November 20th at 6pm. All of the details, hours, and costs are below. SAN JOSE – Kristi Yamaguchi Downtown Ice will be front and center during holiday, college football and hockey activities this extended skating season, which lasts from Nov. 16 through Jan. 27. The ice rink will be home to Downtown San Jose for the Holidays with partners Christmas in the Park and Winter Wonderland. Combined, the three attractions attract more than 800,000 visitors. To accommodate the College Football Playoff the first week of January, Christmas in the Park will close at midnight on Christmas; Winter Wonderland on Dec. 31 – while Plaza de Cesar Chavez transitions into the Championship Campus’ “Quad” area Dec. 26-Jan. 3. The College Football Playoff Host Committee plans to utilize Downtown Ice and call it “Championship Ice” Jan. 4-7. The rink will also have a different look for that week. The skating season stays open two weeks longer than normal – through Jan. 27 – for the NHL All-Star weekend starting Jan. 25, as the Sharks host the league’s best players at SAP Center. With all the special events surrounding the rink, Downtown Ice has a bounty of new and national partners. Say hello to new sponsors College Football Playoff Host Committee, Alaska Airlines, National Hockey League, San Jose Sports Authority, Google, Adobe and Amazon. Swenson, PG&E, The Sobrato Organization, Wells Fargo, The Office of Cultural Affairs, the City of San Jose, Republic Services and Valley Transportation Authority return as loyal partners for this fun holiday family tradition. Longtime media partners include Clear Channel Outdoor, Bay Area News Group, The Mercury News, Silicon Valley Community Newspapers, NBC Bay Area, Telemundo 48, El Observador, Mix and K-Bay and KQED. Proceeds from the Dec. 16 Santa Run Silicon Valley also help support Downtown Ice and Christmas in the Park. Sign up at santarunsv.com. Also, as usual, the trees of the Circle of Palms will be lit with thousands of color-changing LED lights to delight skaters. This will be Downtown Ice’s 15th year in the Circle of Palms. To celebrate the milestone anniversary, the rink will have a fresh look this year, with new dasherboards, rail caps and ice mats, plus some new plumbing under the platform to provide a more efficient freeze. Yamaguchi, the 1992 Olympic gold medal winner in women’s figure skating, will celebrate the opening of San Jose’s ice season with sponsors on Nov. 20 at 6 p.m. Yamaguchi adds her name to support the rink for the eighth time, and her Always Dream Foundation will again be a rink beneficiary. Rink hours vary over the course of the season. Events and Promotions Manager Amy Anderson has special events planned during the season. Details are at downtownicesj.com, which has also been improved for mobile users. More than 60,000 skaters and 120,000 of their friends are expected to visit the ice this season. The rink generates more than $4 million in economic impact to San Jose. During November, early December and after the holidays in January, Downtown Ice is open 5-9 p.m. Monday-Thursday; 5 p.m.-midnight on Friday; noon-midnight on Saturday; and noon-9 p.m. on Sunday. 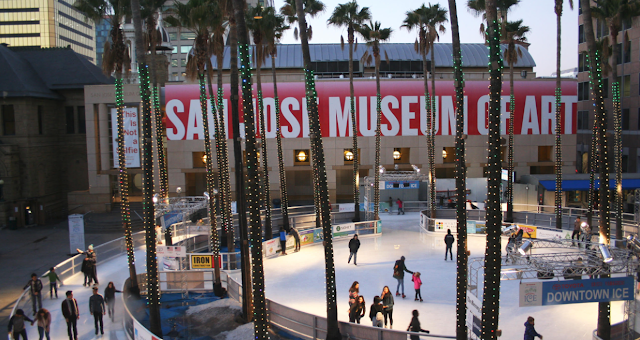 During the winter break, the rink is open 11 a.m.-midnight daily. Special hours apply to the holidays and may change around the big events. The rink phone number is (408) 291-0525. Parking information is at http://parksj.org. Monday - Tuesday 5 - 9 p.m.
Monday - Thursday 5 - 9 p.m.
Monday - Thursday - 10 p.m.
New Year’s Eve 11 a.m. – 10:30 p.m.
Tuesday – Thursday 5 - 9 p.m.
Monday 5 - 9 p.m.
Monday - MLK, Jr. Day 11 a.m. - 9 p.m.
Tuesday – Wednesday 5 - 9 p.m.
Sunday . 11 a.m.-9 p.m.
Cash, Paypal, Visa and Mastercard accepted. Admission includes ice time and rental skates (skate sizes range from toddler 8 to men's 15). Skate all you want (no in-and-out privileges)/ First-come, first-serve.